A very great news, another year has come our way! As you can see, I celebrated well the coming of 2016. I hope that this year is one of a more peaceful time for the world. I hope that we find solutions to mend the rift amongst us all humans in this beautiful wide world, which keep getting smaller and smaller everyday. To 2016, may it be of prosperity, peace, brotherhood and goodwill to all mankind. 2016 will be a very important year to some countries who will be electing new officials in their governments. All I can say is that you need to vote wisely for these officials, who will have the power to change your country and of the wider world. Remember, ultimately you deserve who you elect to govern. The UK would also be deciding whether to stay in the European Union or come out altogether and bypass being a member of a federal Republic of Europe. We need to think hard and weigh the pros and the cons of staying in or out. Come May, we will also be electing a new mayor. Let us vote for someone deserving. May we all bring forth a decision that would be best for all. Peter and I went to bed very late last night. We stayed up for the presidential debate between Democratic candidate, Hillary Clinton and Republican nominee, Donald Trump. Donald Trump was able to fence vocally with the lawyer wit of Hillary. One thing though that we’ve noticed throughout the debate was the bias toward Hillary of the moderators, Cooper Anderson and esp3ecially Martha Raddats. Time and again she would allow Hillary to go over the 2 minutes allotted time but she would chastise Donald for even a couple of second longer. Martha’s moderating left something to be desired! Yesterday was the start of the Rio 2016 Olympics, which was a 10th times cheaper than the London 2012. Canada has been battling a massive fire that has been going on for days. It is likely to cost billions to settle the damages. I hope they are insured! Peter and I went out to vote today at our local polling station. 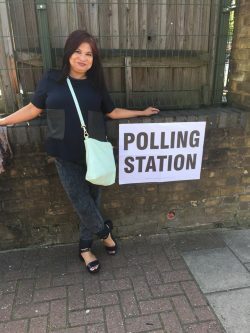 We had to vote for the new London Mayor, our Barnet MP and National Assembly. It was pretty quiet when we went at around 11:30am. Can’t wait for the result. Will Zac Goldsmith replaces Boris Johnson? Or will it be Labour’s Khan? Sadiq Khan is the new London Mayor. Omg! My washing hanging nice and lovely in the garden had been attacked by hailstone. Can’t believe there are still hailtones about. It is now the end of April. where is that lovely warm spring sunshine?!!! OMG, what is happening? Prince, the flamboyant, most influential singer of his time just died at the very young age of 57. Sad day especially for me as he was my generation. I can’t believe it! Another death in the UK celebrity world. Victoria Wood, a prime UK television comedian has just died at the age of 62. It was apparently from a quick battle with cancer. OMG, if I had to record everyone who died so far this year, this particular blog would be more of an obituary. It is so lovely today. It is like early summer, really contrary from yesterday, which rained throughout the day with wintry temperature. Today, it is hot and lovely and the new garden parasol is in use. It is Easter holiday weekend but this Saturday is just one of the wettest of the year yet and it is expected get worst with gales hitting the capital. It was lovely and springlike just yesterday. Europe and Russia are working together to research the Red Planet. They have today sent into space towards Mars and unman rocket to search for life in Mars. Apparently there is a very titillating matter of the presence of methane gas in Mars when there shouldn’t be. We will hopefully find out more in 8 months to a year! Barack Obama must have been having a bit of a hizzy fit after claiming that David Cameron and the UK are free riding and not paying our own with the war in Libya and other war mongering. What happened to close ‘special relationship’ between the UK and the US? Honeymoon is over?!!! Just a few days ago, photos of the Family Cambridge’s family skiing holiday together, were officially released by Buckingham palace. I am afraid the public did not really appreciate the look of grand holiday when most Brits suffering the cold weather in old Blighty. It is being commented that William hardly needs to go on a holiday when he had hardly been at work as well as not done many public engagement! Awww, have we fallen out of love with the beautiful Family Cambridge?!!! We got back from the Philippines after almost a month long holiday visiting the family. Peter and I had a really good time. Peter especially love the bonding around the dinner table. He found it happy, wholesome and how a typical family should be. Currently in Laoag City. We are looking forward to touring the city itself and nearby Vigan, which is one of the World Heritage site. Another death to report. Terry Wogan had died after a short battle with cancer. Hope the mortality rate in the month of February is lower. We are going to the Philippines for a month long holiday soon. The preparation is not as smooth as can be. There have been some last minute health issues which is rather unsettling. Hope everything goes well and that we have a peaceful, calm and happy holiday with my Filipino family. This month of the year has seen so many deaths. Today Colin Veanrcombe, lead singer of Black has pass away. His death was from a traffic accident where we ended up in a coma and he had never regain consciousness. One of my favourite songs ever. It is rather melancholy but rather uplifting all the same. Another death, I am afraid. This time it was Glenn Frey, lead guitarist of one of my most favourite rock bands ever, the Eagles, the group that brought us in my opinion, the best guitar intro. Glenn Frey died still relatively young at 67 from complications from rheumatoid arthiritis and colitis. RIP, Glenn Frey. You are a legend. Another death. This one particularly affected me because it is Alan Rickman, my favourite British actor of all time. So very sad as the British movie and film industry will miss him so much for his great presence, acting and persona. This is the strangest story so far of the year. Rupert Murdock has just announced his engagement to the ex-supermodel, ex ‘Mrs” Jagger, Jerry Hall. I find this coupling rather strange as it was so unexpected. Jerry has enough money of her own so she does not really need anyone for want of wealth. I supposed, Henry Kissinger is right then in saying ” Power is the ultimate aphrodisiac.” This is the only explanation I can come out with. Murdock is from from being a broncho billy buck, and Jerry, not being a spring chicken herself, is still so much younger than Murdock. David Bowie has died at the age of 69. Too young nowadays. Happy ~Three Kings, it is the Twelft Night today and as traditions go, Christmas decorations have to come down. Christmas is truly over. We just taken down all the Christmas decoration. It has been so lovely to have all our little Christmas trinkets collected over the years around us. But now they have to go to the loft to rest for another 10 months.